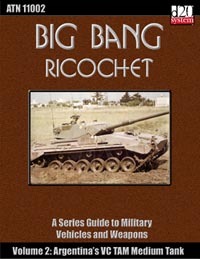 This second issue of Big Bang Ricochet completes the coverage of Argentina’s indigenous military vehicles, covering the Vehiculo de Combate, Tanque Argentino Mediano. This medium tank is built on the same chassis as the VCTP covered in Volume 1. Along with coverage of the tank, we also provide a very deep look at the British L7 105mm Rifled Tank Gun, as well as a number of additional tank guns derived from it, plus ammunition. The TAM’s machine guns are local production of the FN Herstal MAG 58 7.62mm GPMG, which means were covered in Big Bang Special Edition under the entry for the US M240 Machinegun. In addition, general Armored Fighting Vehicle information is expanded by providing details and descriptions of numerous types of armor used around the world to protect these military vehicles, including some new types which are only now just on the verge of becoming commonplace.